Located north of Sechelt and the village of Tuwanek, this park offers views of Sechelt Inlet, the Sechelt Peninsula, and town of Sechelt. Access is by 4-wheel drive to the mountaintop hiking area and Richardson Lake with its rustic campsites. 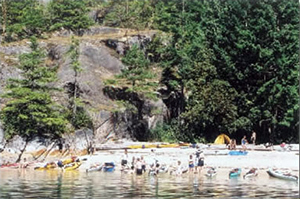 Its shoreline includes three of the boat-accessible camping sites within Sechelt Inlet, at Oyster Beach, Nine Mile Point and Tuwanek. Bring your own drinking water as potable water is not available in the park. There is an intermittent stream that runs through the Tuwanek camping area, which may be dry during the summer. There is a boil water advisory for all streams. From Sechelt take Wharf Road and East Porpoise Bay Road for 10 km to Tuwanek. Just beyond the Tuwanek sign turn right on Upland Drive and then turn right at the stop sign onto the gravel road. You will note a “Tetrahedron” sign here. This is an active logging road (normally active from 7am to 6pm weekdays). Please read all signs, watch for logging trucks and drive with extreme caution. Continue half a km to the left, and then take the left fork. After another 6 km turn left on Branch 300 (near the 7 km marker). On Branch 300 drive for 4 km to the foot of a steep hill where the road becomes four-wheel drive. Either park here and walk the remaining km or continue in 4 wheel drive. Where the road flattens out there is a road to the left that leads to Richardson Lake and the old Forest Service campsites. The main road continues for a few hundred metres and leads to a superb view of Sechelt Inlet. History: This area was never logged but parts of the park were swept over by a forest fire about 75-80 years ago and the two different age classes (trees older than the fire and trees that grew after the fire) are immediately apparent when viewing the mountain. Conservation: This park represents a rich functioning ecosystem containing ocean shoreline, intertidal zone, foreshore and mountain, providing habitat for a wide diversity of life forms. Wildlife: This unique rain-forest type microclimate is home to many different species such as black-tailed deer, turkey buzzards, osprey, flying squirrels, eagles, doves, owls, pileated woodpeckers, coyotes, bobcats, martens, cougars, black bear, loons and snowshoe hare. There are opportunities for canoeing or kayaking in this park. There are rentals available in Tillicum Bay and Sechelt. Charts of the area are #3512 Strait of Georgia Central Portion and #3514 Jervis Inlet including Sechelt Rapids. The Topographic Map for this area is Sechelt Inlet 92G12. For the Mount Richardson west side trail follow the driving directions as far as the “west road,” then, about 800 metres after this junction, an old grown-in logging road off to the left leads in the direction of the peak. This road ends in a forest plantation and from there it is a bush whack to the ridge leading to the summit. You can also reach the summit from the lake by bush wacking through the timber to the summit. For your own safety and the preservation of the park, obey posted signs and keep to designated trails. Shortcutting trails destroys plant life and soil structure. Hunting is permitted only during lawful game hunting season. Check the BC Hunting & Trapping Regulations Synopsis for regulations. There are scuba diving/snorkelling opportunities in this park. Rentals are available in Sechelt. Campfires are permitted. Fires must be kept to fire-rings if provided, or below the high tide line on the beach. While campfires are allowed and campfire rings are provided at each campsite, we encourage visitors to conserve wood and protect the environment by minimizing the use of fire and using campstoves instead. Firewood can be purchased in the park or you may bring your own wood. Fees for firewood are set locally and may vary from park to park. Limited burning hours or campfire bans may be implemented. To preserve vegetation and ground cover, please don’t gather firewood from the area around your campsite or elsewhere in the park (this is a ticketable offence under the Park Act). Dead wood is an important habitat element for many plants and animals and it adds organic matter to the soil. This park has pit toilets – no flush toilets. This park offers vehicle accessible campsites on a first-come, first-served basis – campsite reservations are not accepted. These sites can only be accessed by 4x4 vehicles and available on a year-round basis. Oyster Beach: Is a small camping area 2 to 3 sites of hard packed gravel. The beach is gravel with barnacle covered rocks. It has a pit toilet and a group fire ring. Firewood is not provided. Water is not available at this site. Anchorage in the bay is poor when there is a Southeaster, Westerly or a “Small Craft Advisory.” Monitor the Coast Guard Radio Weather channel, listening for the Merry Island Light station report. Beware of local daily winds picking up in the Inlet. Nine Mile Point: Is the largest of the 3 marine sites, and can be easily reached in a day. It has 2 group fire rings. Firewood is not provided. It has one pit toilet. Water is available, however there is a “boil water advisory.” The beach is gravel with barnacle covered rocks. Anchorage in the bay is poor when there is a Southeaster, Westerly or a “Small Craft Advisory.” Monitor the Coast Guard Radio Weather channel, listening for the Merry Island Light station report. Beware of local daily winds picking up in the Inlet. This is an excellent site to watch the sunset.